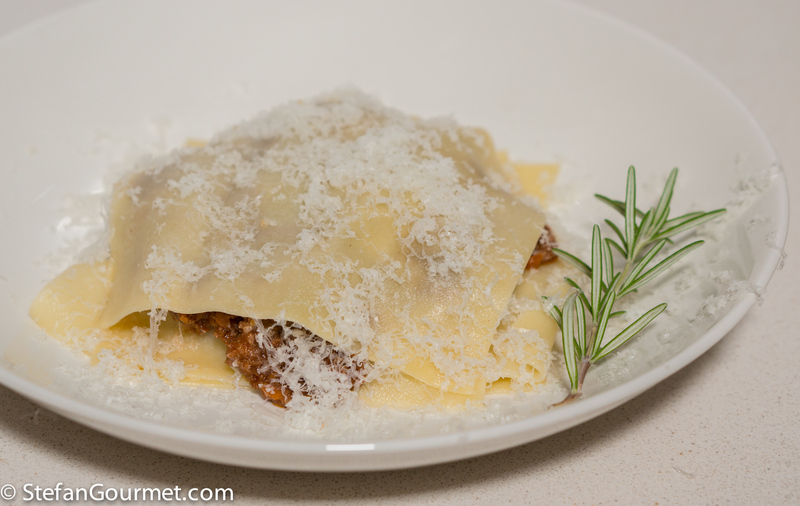 When we had dinner at Michelin-starred restaurant S’Apposentu in Sardinia (read about our experience there in my review), one of the dishes that I decided right away I wanted to try at home was an unbaked lasagna with a mutton ragù. The idea is quite simple: alternating layers of fresh pasta and ragù are served without the usual step of baking the lasagna in the oven. The version at the restaurant was made with egg pasta and included some green beans, but I thought it would be nice to keep it Sardinian with pasta made using semolina flour and water only, and to omit the beans. 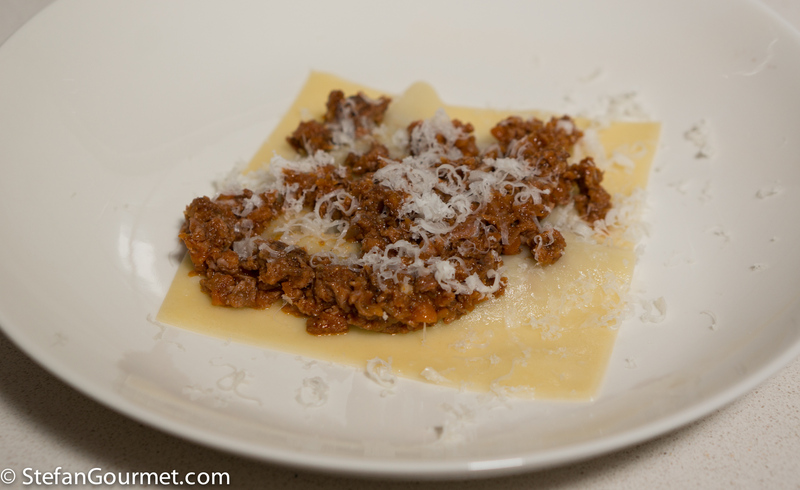 I used lamb and decided to cook the ragù sous-vide to give it a silky texture. The meat is browned before grinding it, which gives the best of both worlds: the flavor development from browning without the gritty texture. Together with the silky pasta this turned out to be an amazingly delicate and delightful dish that would be lovely to grace your dinner table during the holidays. The only drawback is that you have to work fast (and not serve too many portions), so the pasta and ragù don’t cool off too much while you assemble the lasagna. 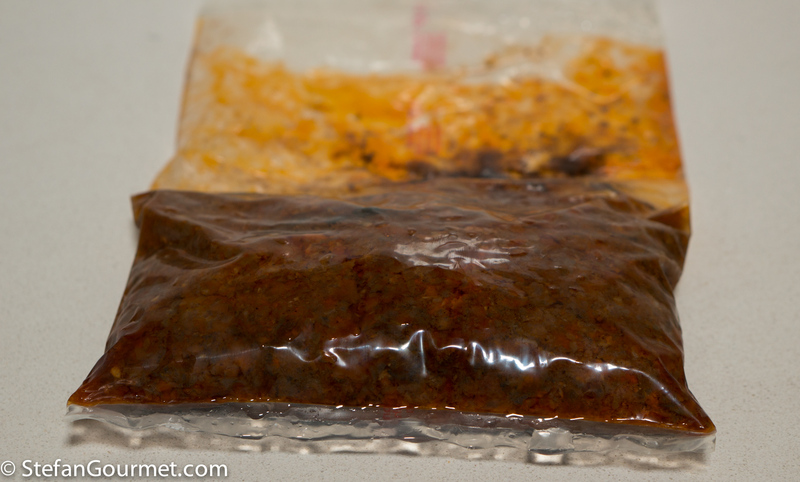 You could of course make the ragù without the use of sous-vide, but it will be difficult to obtain the same silky texture. 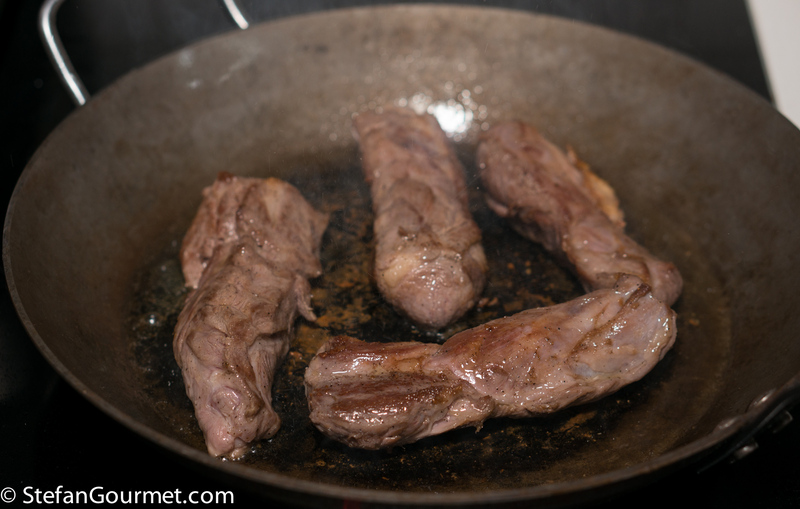 Neck fillets are a great cut of lamb for this, because they contain a lot of intramuscular fat and connective tissue (which means flavor). 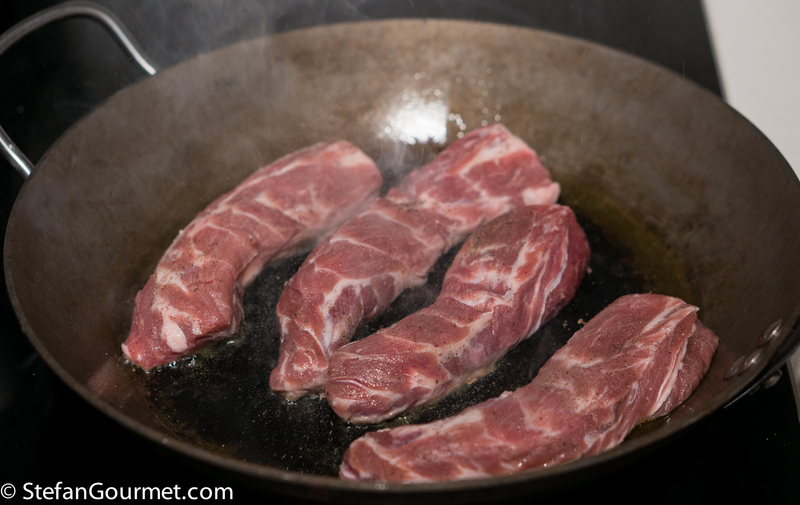 Similar cuts are lamb breast or shoulder. Season the lamb neck fillet with salt and freshly ground black pepper. Heat 2 tablespoons olive oil in a frying pan over high heat. 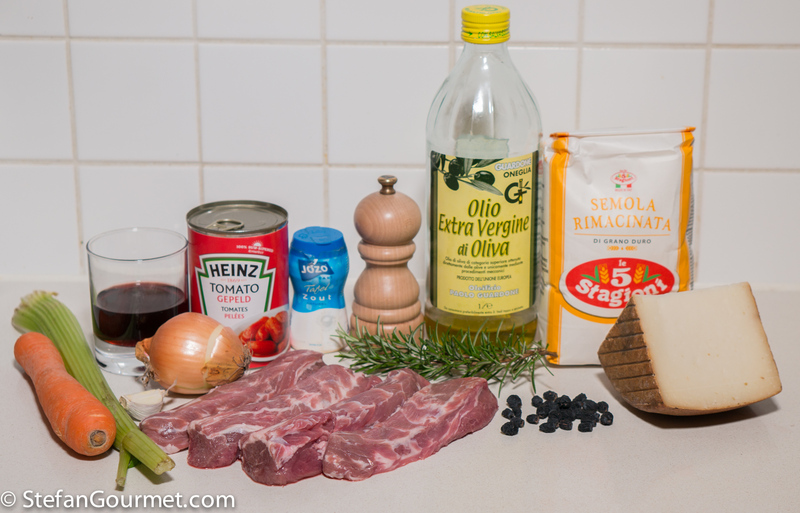 When the oil is hot, add the lamb fillets. Brown them on all sides to develop the flavor, then put them aside on a plate to cool. Turn off the heat. 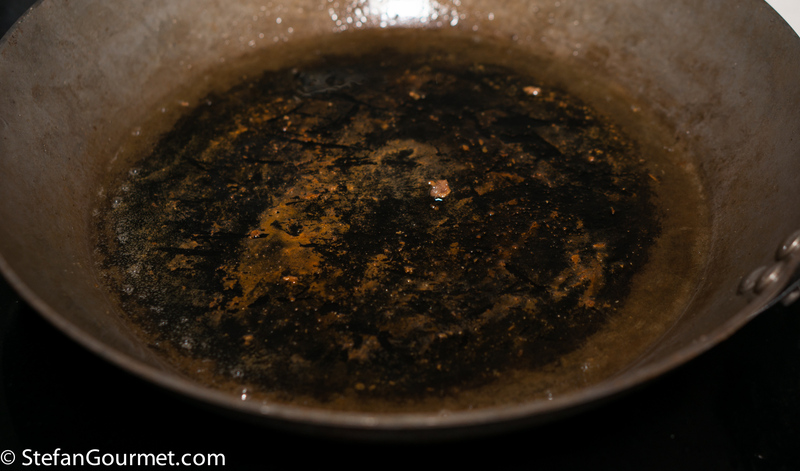 Do not clean the pan, because there is a lot of flavor in the drippings that are left behind. 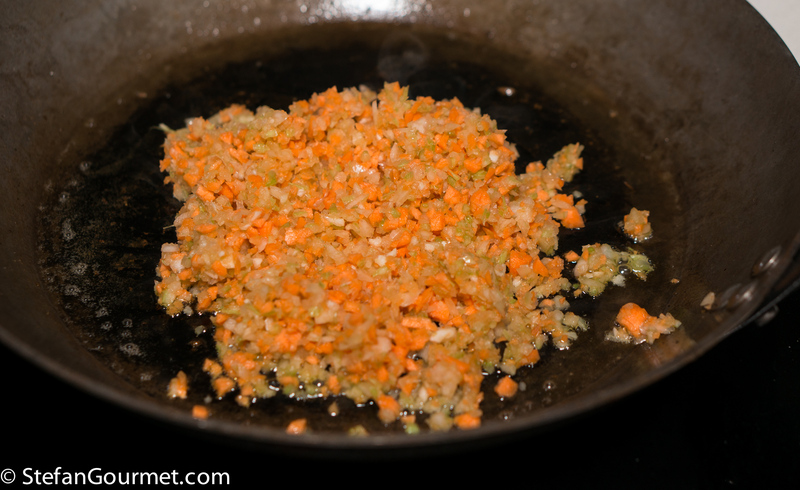 Add minced carrot, celery, onion, and garlic. Season with salt. 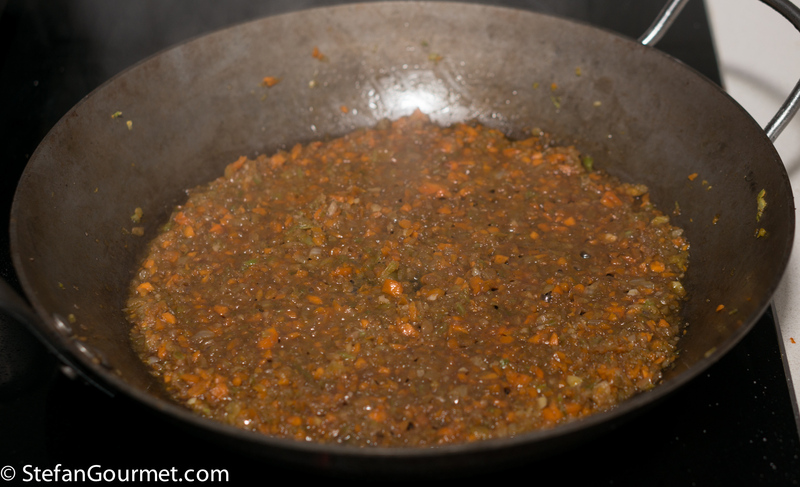 Stir over medium heat until the vegetables start to color, 5 to 10 minutes. 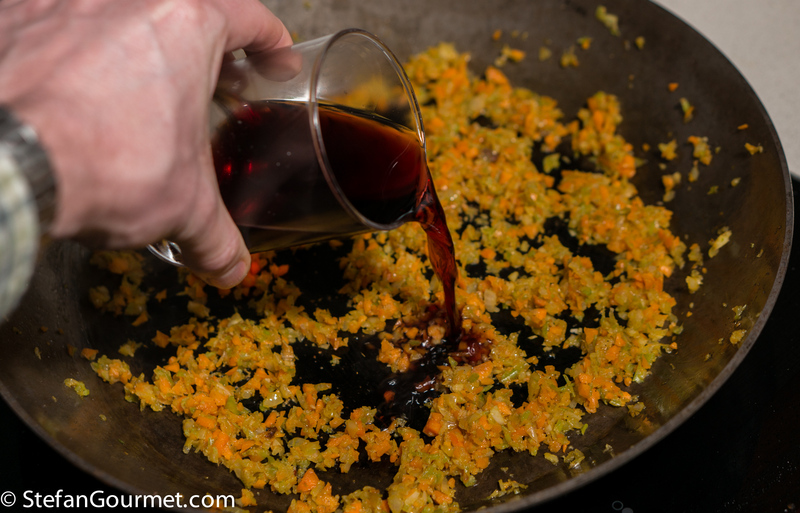 Then deglaze with 80 ml of red wine. 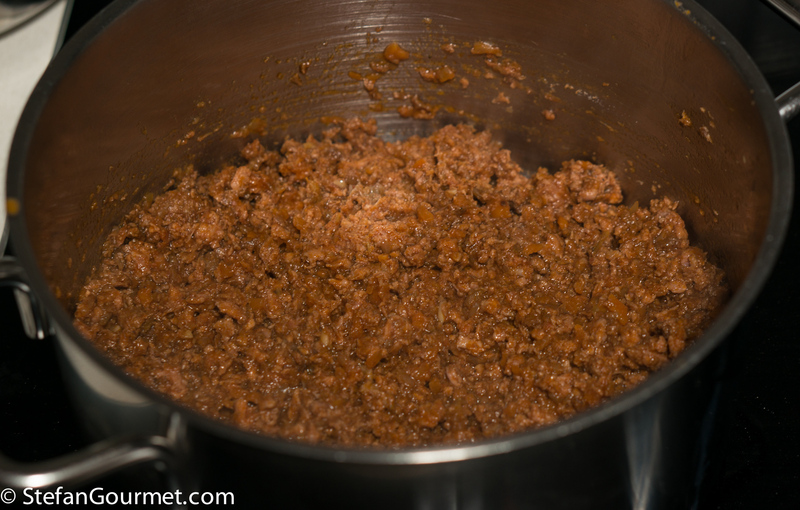 Stir over medium heat until most of the wine has evaporated. 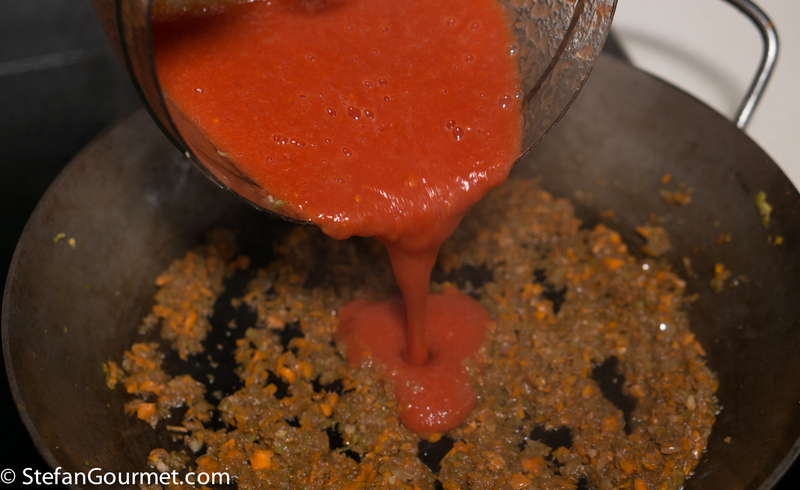 Puree the peeled tomatoes in the food processor and add to the vegetables. Stir to mix. Season with salt and freshly ground black pepper. 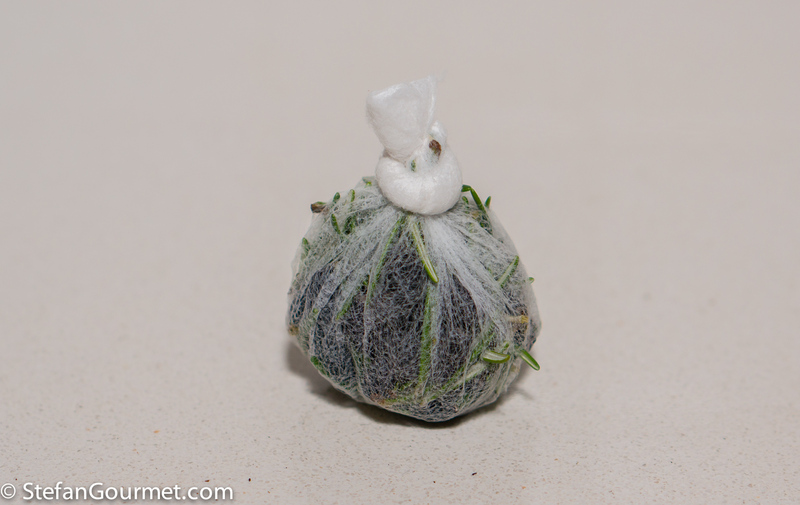 Wrap the rosemary needles (and myrtle berries, if using) in a disposable hairnet or other suitable piece of cloth. 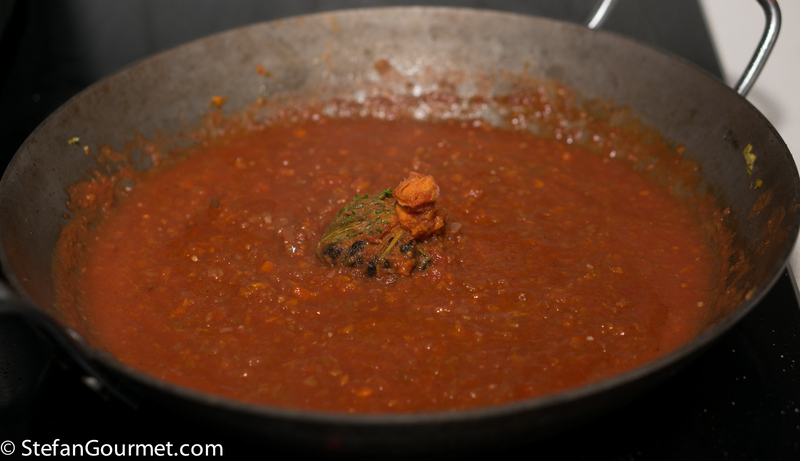 This will make it easier to remove the rosemary and myrtle berries before serving, as they would otherwise destroy the silky texture of the ragù. Add this to the tomatoes. 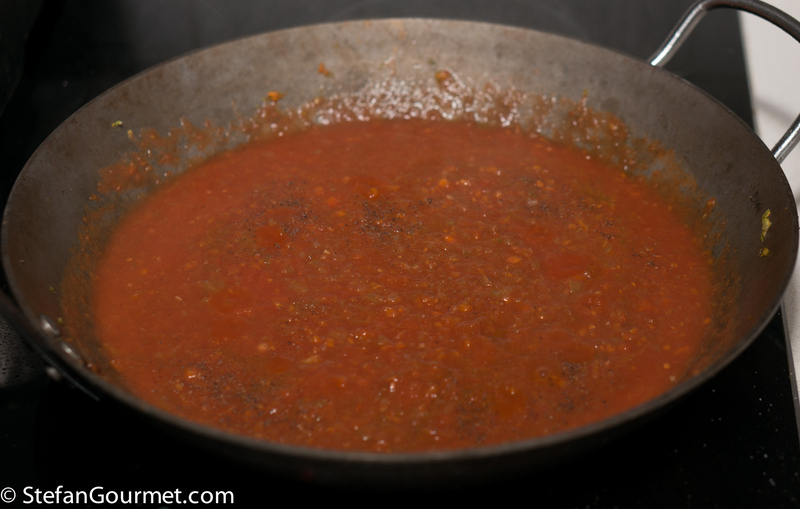 Bring to a boil, then simmer over low heat until the sauce is thick and almost dry. Turn off the heat and allow to cool. 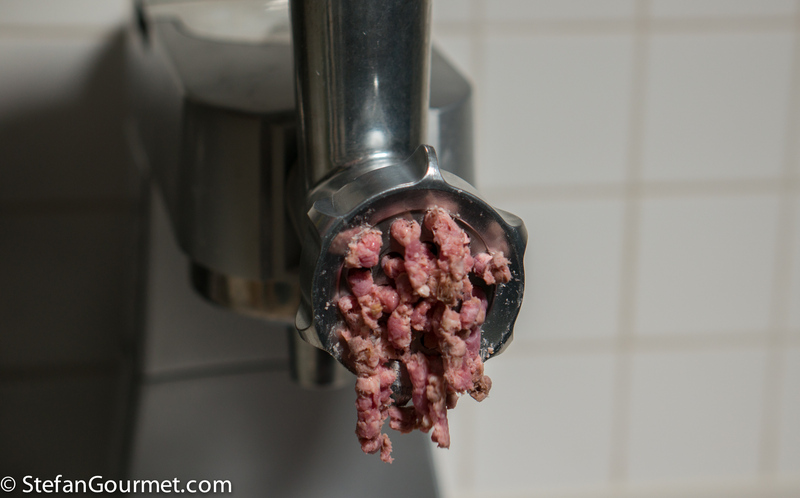 In the meantime, grind the lamb in a meat grinder. Vacuum seal this mixture together with the rosemary (and myrtle berries, if using). 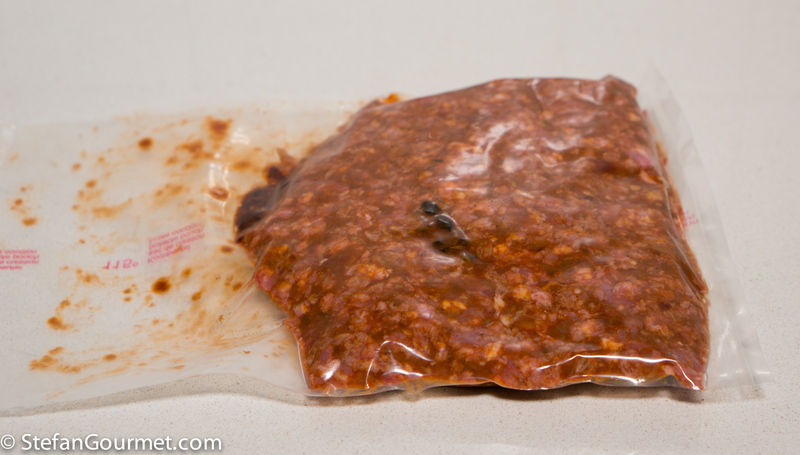 If you do not own a chamber vacuum sealer, you can use a ziploc bag and the water displacement method instead. Cook sous-vide for 24 hours at 74C/165F. 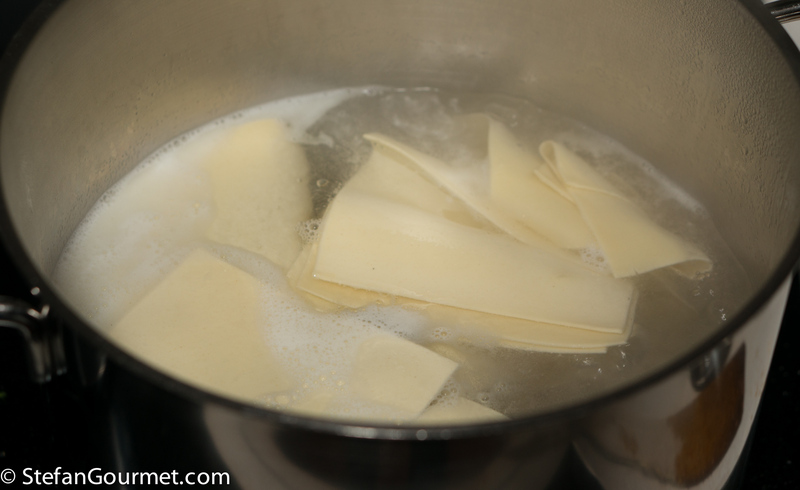 Make pasta dough using the flour, olive oil, and as much lukewarm needed (start with 80 ml or 1/3 cup and add little by little) to allow the dough to come together. The procedure is described in this post. Wrap the dough in cling film and allow it to rest in the refrigerator for at least half an hour. 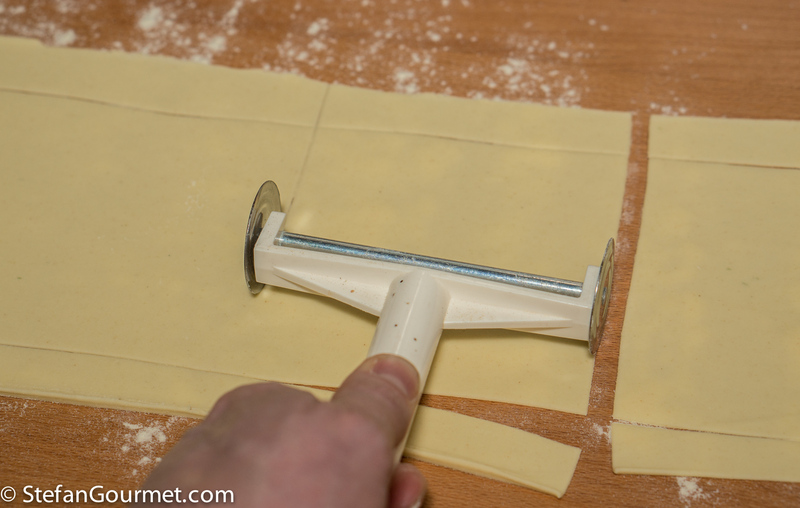 Then roll it out to the one but thinnest setting (i.e. setting “8” when the thinnest is “9”) and cut it into 10 cm (4″) squares. 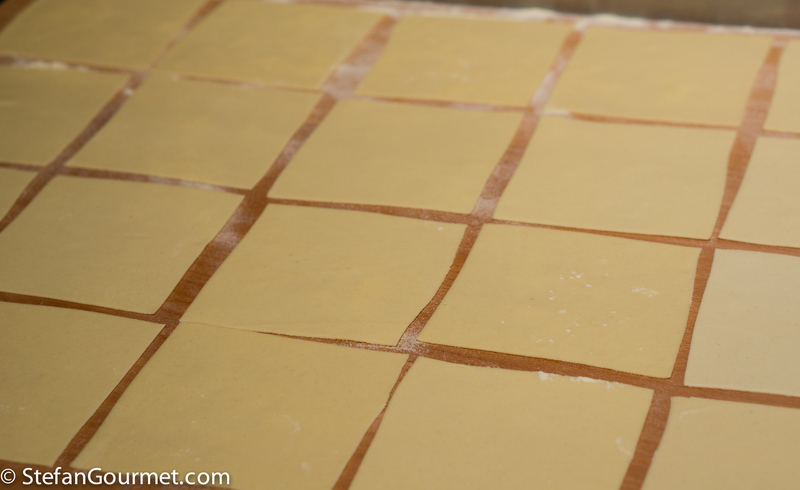 Arrange those squares in a single layer on a surface sprinkled with flour to prevent sticking. You will need 16 squares for 4 servings (4 per serving). When it is time to assemble the lasagna, make sure to preheat the plates. Bring a large pot of water to a boil. 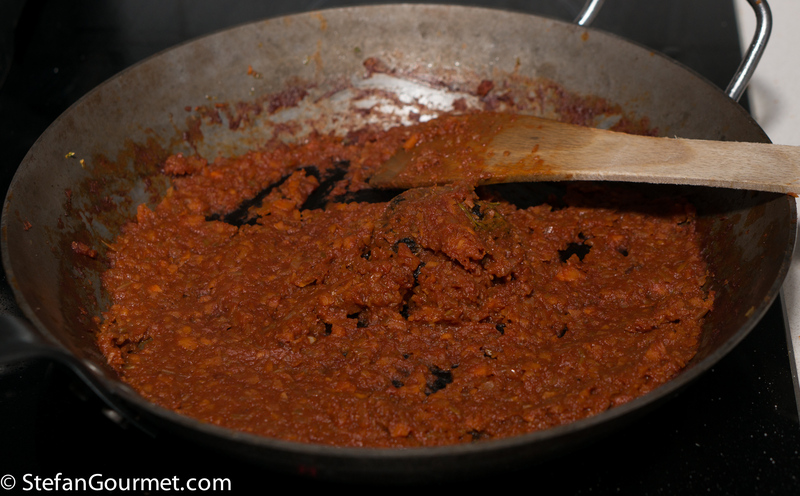 Keep the ragù warm over low heat. 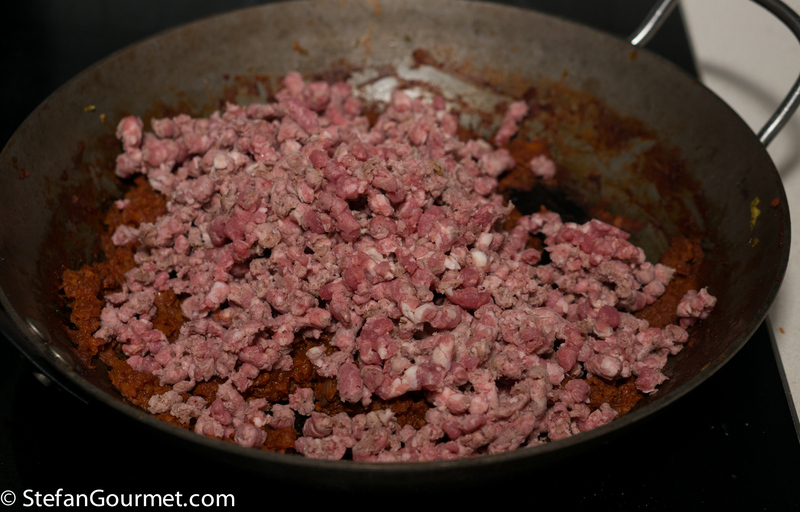 Taste and adjust the seasoning of the ragù. The pasta sheets need to cook for only 1 minute. It is best to cook only 4 or 8 at a time, and fish them out with a strainer, so they don’t cool off too much while you assemble the lasagna. On each plate make alternating layers of pasta and a heaping tablespoon of ragù, sprinkled with freshly grated pecorino. You could finish with either ragù or pasta but in any case make sure to sprinkle with plenty of freshly grated pecorino. Serve at once. An elegant red would be perfect. 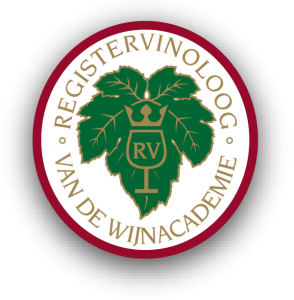 Cannonau di Sardegna could fit the bill, depending on the producer’s style. 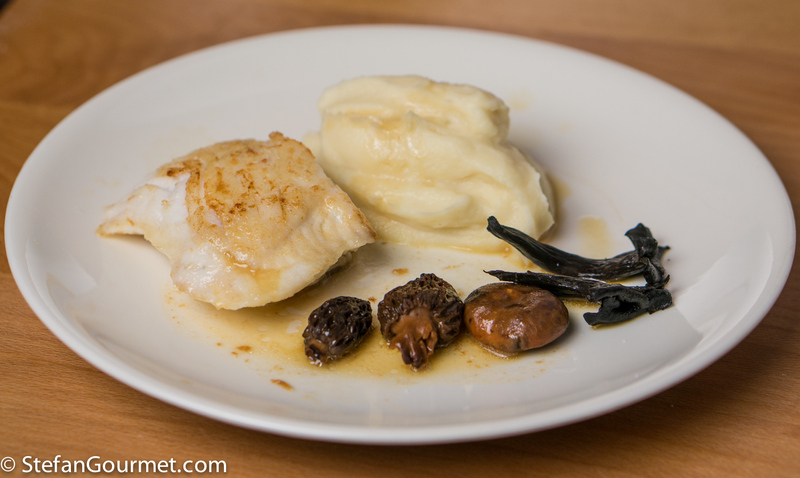 Turbot with morels, wild mushrooms, and celeriac puree is a decadent and delicious dish, so it’s perfect for the holidays. What an interesting idea! A lot of work but I bet your version was spectacular! I was surprised how great it turned out. The texture was so special. nice too to cut lasagne stef! 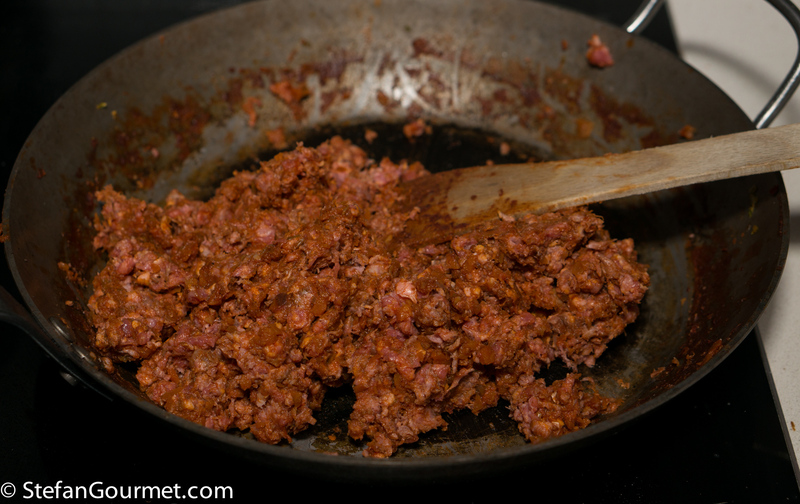 You really ‘must’ try it for ragù, the texture is really amazing. You are right, on the menu of the restaurant it was called “lasagnetta”. What an interesting way to serve my very favourite meat! Hmm: yes, the hands would have to be fast and supple 🙂 ! Love the idea of the rosemary needles and myrtle berries for a ‘je ne sais quoi’ flavour And, at the moment, I have no close Italian friends to feed – so, after all this work methinks this will be tried as a secondo 🙂 ! I think it would be perfectly acceptable to have just this (with a salad on the side) as a full meal, but Italians would still call it a primo piatto even if it is the main course. Ho fatto le lasagne alla genovese al forno; la prossima volta sicuramente le farò così. Grazie Paola! It’s almost lunch time as I read this post so makes the idea of eating this dish even more mouth watering !!! Eating lasagne like this (i.e. without finishing off in the oven) is called “lasagna aperta” or “lasagnetta aperta”. Looks delicious. Quite a lot of work but I am sure worth it. It does look like a lot of work, but so is a lasagna that you bake! Very nice dish Stefan. I wonder if roasted eggplant could be used in place of the pasta for a GF version. This looks incredible! It would become a different dish, but probably good. To get the same delicate effect, I suppose rice flour could be used to make GF lasagna that is just as delicate? Or, peel and steam slices of eggplant. Or steam cabbage leaves? This is the first I’ve heard of “lasagnette” but I’m intrigued. 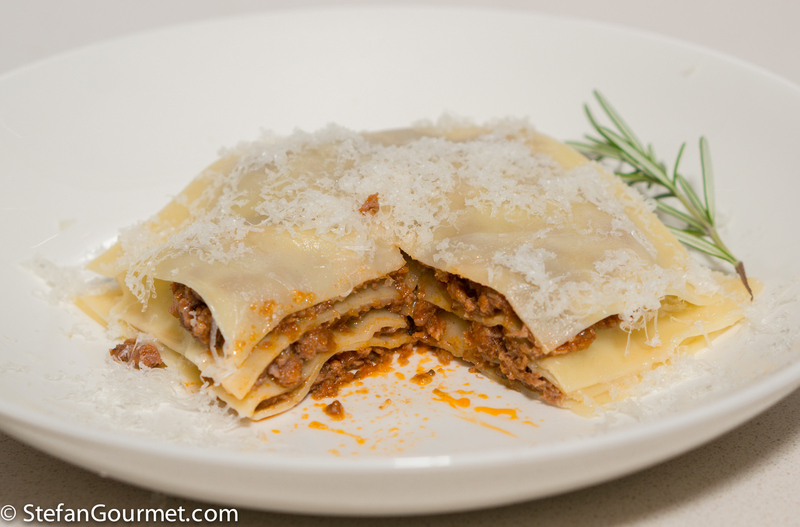 Without the cheeses(s) of lasagna, the emphasis moves to the ragù — and a lamb ragù would be perfect. A great dish, Stefan.